A beautiful deck built into your outdoor living space is a haven where you, your family, and friends can all appreciate spending time together. Barbecuing, gathering for drinks, or simply enjoying the view are seamless on a solidly built deck. Fortunately, the mild rainforests of Vancouver Island produce amazing coastal softwoods, cedar being one of them. Undoubtedly, cedar wood is the best choice for decking for a number of reasons, particularly if you want your deck to last. Treated or untreated, cedar incorporates natural beauty, as well as providing a safe walking surface in your outdoor living space. Longhouse can pre-stain cedar siding in-house, a big advantage over competitors. Cedar decking is affordable, costing less than, say, composite decking, and lasting longer than cheaper types of decking. A naturally great insulator, a cedar decking remains cooler than other decking material when exposed to hot summer sunlight. Inexpensive treated wood may be full of moisture—thus, it will shrink unevenly and even bend once dried. Therefore, cedar looks better longer. Cedar decking ordered from Longhouse Specialty Forest Products is FSC® certified, so it is an eco-friendly choice for modern builds. Cedar decking is breathtakingly beautiful, unlike many artificial decking products that attempt to look aesthetically charming but don’t quite hit the mark. Left untreated by toxic chemicals, cedar’s natural beauty still shines through while resisting rot. With proper maintenance, cedar decking lasts longer than other decking. Purchasing pre-stained siding offers a resilient and attractive final product, available in any colour. Cedar resists mold, unlike other decking materials, such as composite, which is susceptible to mold and mildew on the surface and in the product’s composition. Also, cedar siding is prone to less rot and bacteria than other types of wood. Wood decking is entirely biodegradable and comes from a renewable resource. Cedar decking material is safe. Mildew growth on a composite deck surface is extremely slippery, and therefore, dangerous, to walk on. Cedar has more flexibility than say, redwood, and since it’s also less dense with less natural oil, it is thereby more accepting of stain. Lighter cedar wood decking is easy to work with. Cedar is durable—other decking materials wear more easily. For instance, indents or abrasions inflicted on composite decking products cannot be sanded out. Custom cut yellow cedar decking is conveniently manufactured at the mill in Parksville. Cedar secretes oils (extractives) that resist harsh weather, moisture, and insects, such as carpenter ants. Indeed, most cedar lasts 15-25 years, often longer. Cedar decking is versatile. 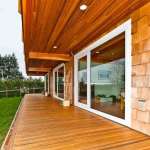 For example, western red cedar, accepts different bleaches, stains, colours, and finishes. It can also be purchased in a variety of grades, dimensions, and textures, unlike other decking materials. Pre-stained or untreated cedar and all other types of cedar products are readily available from Longhouse, so if you’re an islander, you’re supporting a local business. Ordering pre-stained cedar makes the job easier, helping you avoid the costs of hiring someone to apply the stain. Moreover, pre-finished decking purchased from Longhouse Specialty Forest Products can be shipped anywhere in the world. If you’re a proud homeowner who takes pride in your outdoor living space, putting due care and attention into your cedar decking offers amazing benefits for decades, protected from rotting, weathering, and insect infestations. Select from custom cut Yellow Cedar Decking and Western Red Cedar to handle any climate and all footsteps.